Rahm Schnitzel Dinner- Pork tenderloin medallions seared and sautéed in butter and finished in a shallot mushroom cream sauce. A Drink on the Haus – Whether it is a glass of wine or a cup of Glühwein or a beer, enjoy a German drink on the Haus. Vendor specials – For this one night only, many of the vendors at Weihnachtsmarkt will be running a VIP special just for you. Special music and entertainment – This evening is not complete without a visit form St. Nicholas and Krampus, who will surely make your evening unforgettable. Tickets are $25 for “Friends of the DANK Haus” and $35 for all others. Get your tickets while they still are available. Come join us for a day of German-inspired Christmas shopping, food, and music! Visit the DANK Haus at 4740 N. Western Ave., just one block west of the Western Brown Line on Saturday, December 15th, 2018 from 12:00 p.m. to 8:00 p.m. Santa Claus himself will arrive at 1:00 p.m.and kick off a series of horse drawn carriage rides. Space is limited, so book tickets while you still can by clicking the “Registration” button to the left. We will have German food and drink for sale as you stroll through rows of festive stands. Admission to the market will be a suggested $5 donation that will surely be worth it. All proceeds from the event will support cultural programming at the DANK Haus. For Clarification: December 14 VIP Party – Limited space for our VIP ticketed evening event. Vendor shopping with specials from vendors, German Dinner, drink ticket, and Krampus are what this evening is about. To learn more and register Click HERE. December 15 – Vendor shopping, German food and drink for purchase, Santa, and Carriage Rides available to all. $5 door donation. Vendors: There are still a few spots left! 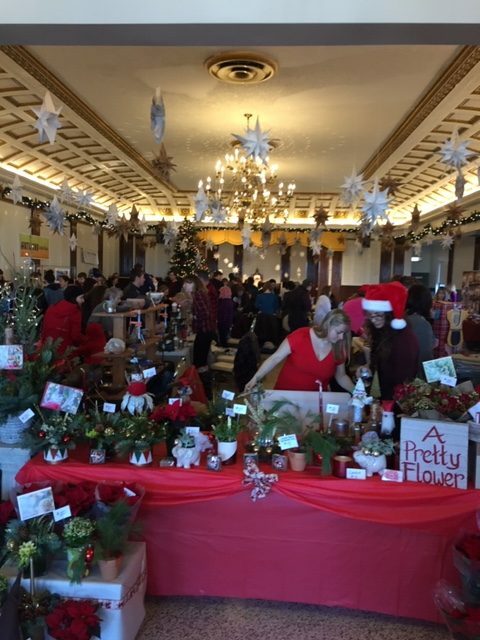 We are especially interested in vendors with hand-crafted treasures and unique gifts to sell. Contact Steven Sartin at steven@dankhaus.com to reserve your spot today.